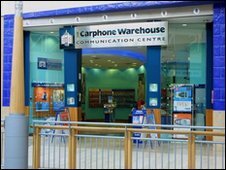 The mobile phone retailer Carphone Warehouse has raised its full-year earnings forecast after recording better-than-expected sales. Its comments came as it reported an 88% rise in pre-tax profit for the six months to 30 September to £75m. The firm's revenues rose 13% to £789m. Chief executive Charles Dunstone said: "Each business has delivered a significant year-on-year improvement." Carphone also said its planned demerger of the TalkTalk business was on track. The group will split into two companies by March 2010 with both Carphone Warehouse and TalkTalk trading separately on the London Stock Exchange. The firm's broadband customer base was up 48% year-on-year to 4.12 million. Strong demand for smartphones - such as Apple's iPhone - also boosted sales. Mr Dunstone also said that the integration of Tiscali UK, which it bought in July, had cemented its position as a leading player in UK telecoms and was enhancing earnings. He added that Carphone's joint venture with the US's Best Buy had also "delivered strong growth". One aspect of the joint venture will see the opening of "Big Box" megastores in spring of next year.